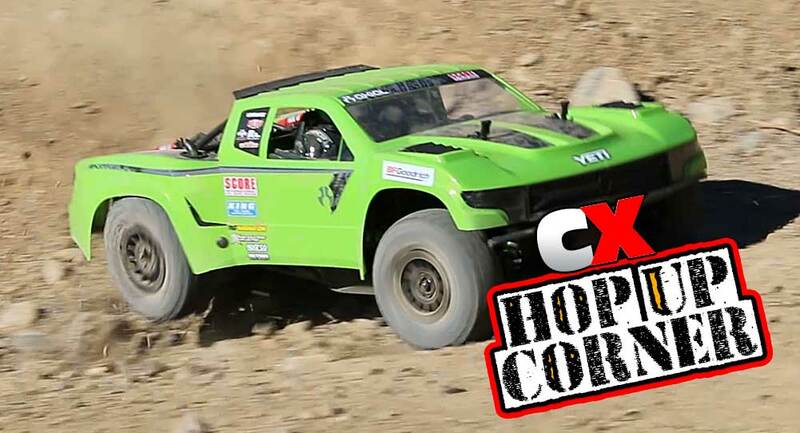 For this month’s Hop Up Corner, we’re digging up some of the best upgrades for the Axial Yeti SCORE Trophy Truck. If you have one of these you’ll probably agree that it’s a ton of fun – so let’s get to upgrading! The suspension on the Yeti STT is pretty amazing. It’s perfectly at home on rocky areas where speed is needed. I was really impressed by how it floated over the roughest terrain (you can see our video here: https://youtu.be/H9U_FO1SfPg). There’s not much you can do to the suspension to make it better, however there is something you can do to make it stronger. The 4-link rear end works great, but both the upper and lower links are 100% plastic, resulting in a little bit of flex. To remedy this and to create a more rigid, sure-footed rear suspension, I suggest picking up and installing both the Axial Upper Link Plate Set and the Axial Lower Link Plate Set. 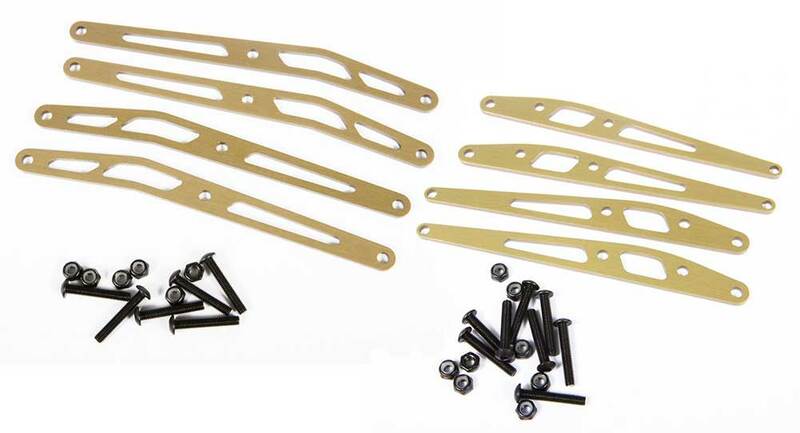 Both of these are made from aluminum, anodized and come with all the hardware needed to fit them to the STT. The electronics in the STT are also top notch. Developed by Castle Creations, this waterproof unit feeds the Vanguard 3150kV brushless motor and can be programmed using the Castle Link software. 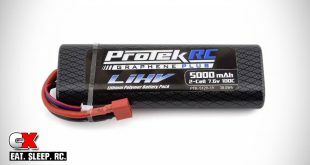 It’s a great unit capable of running on a 3S LiPo, so why not throw one of those in right off the bat? I’ve been using a MaxAmps 6500mAh 3S LiPo Battery now for some time and love the power this thing provides. It fits like a glove and is also waterproof, so I have no fear of running if the weather isn’t cooperating – in fact, it’s an invite to play! This pack includes 12awg Deans Ultra wire and a Deans plug, so make sure you have a Deans adapter for your charger. Knowing that people are going to drive this truck hard on very rough, rocky terrain, Axial has done a fantastic job of making the drivetrain bulletproof. There is one area, however, that I can suggest an upgrade; the spur gear. The stock 64T gear is plastic and, even though it’s well protected by the gear cover, at some point you will strip this out. It’s inevitable – and most likely while you’re out having a good time. 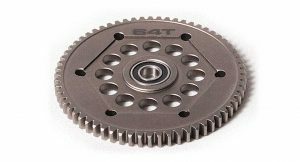 So, why not strengthen this area of the truck right away and throw in an Axial 32P 64T Steel Spur Gear? 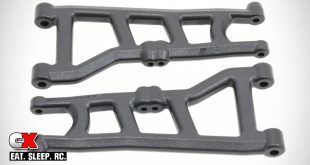 It’s a fairly easy install and does require you to purchase and install another set of the Axial Slipper Pads, so make sure you pick up a set of those as well. 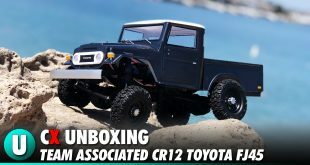 The body on the Axial STT looks awesome, but unfortunately that is the only choice they’ve given us. Unless, of course, you like the old-school retro look! If you’re one of the ones that do (like me), you’ll love Axial’s Retro SCORE Trophy Truck body. It’s a direct fit on the STT and can be used with or without the rear cage. 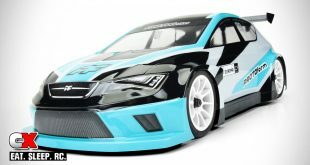 It comes with a molded grill, fender scoops, side exhaust, light buckets, roof spoiler, 2 large sticker sheets and mounting hardware. 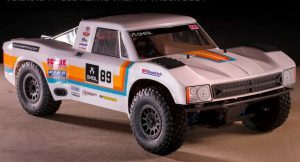 The Axial STT comes with a great-looking set of wheels and tires that work very well on a number of different surfaces. However, like the bodies, there’s not much in the way of style-choices (yet) unless you want to cobble up a way to mount a set of SC wheels and tires. 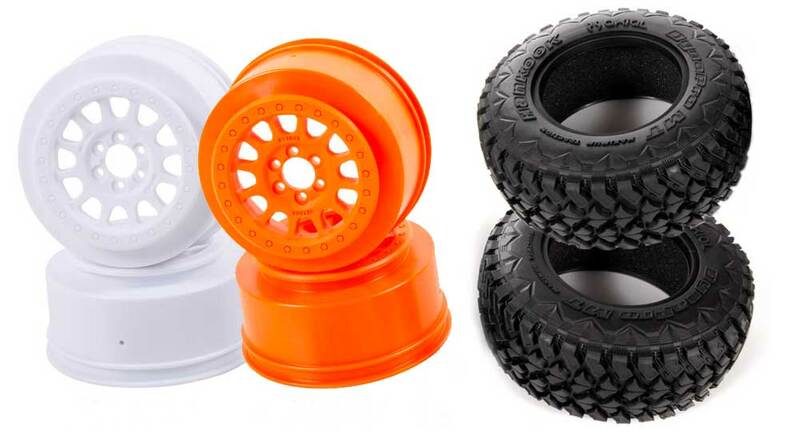 There are a few choices, mainly a set of the Axial Method 105 Wheels in orange, Axial Method 105 Wheels in white or Axial Method 105 Wheels in green. All of these come with the needed mounting hardware and adapters and look great wrapped in a set of the Axial Hankook Mud Terrain Tires. The tires come with inserts and have a nice, thick lug pattern for moving debris out of the way. I had a few different ideas on my accessory list, but my final choice would have to be a Pro-Line Racing Super Bright LED Light Bar. This bar includes all the mounting hardware needed and features a cool, curved design to emulate the roof line of the STT. 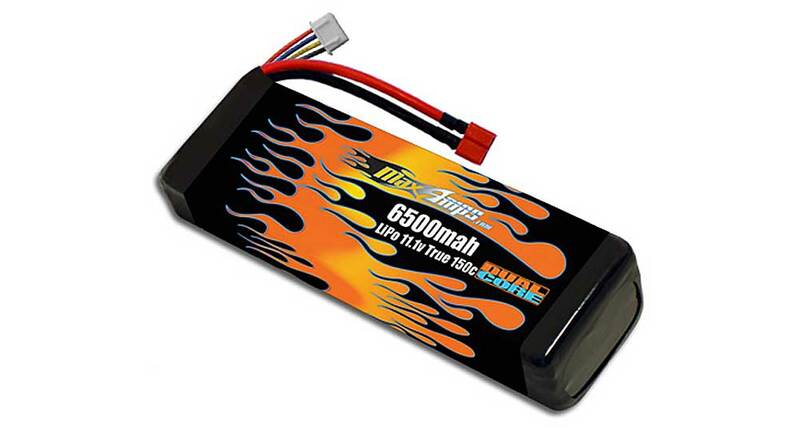 It can be plugged into the receiver or, if you want some serious light, plugged right into a 3S LiPo battery! I have one; I’ve done this; it’s VERY bright! 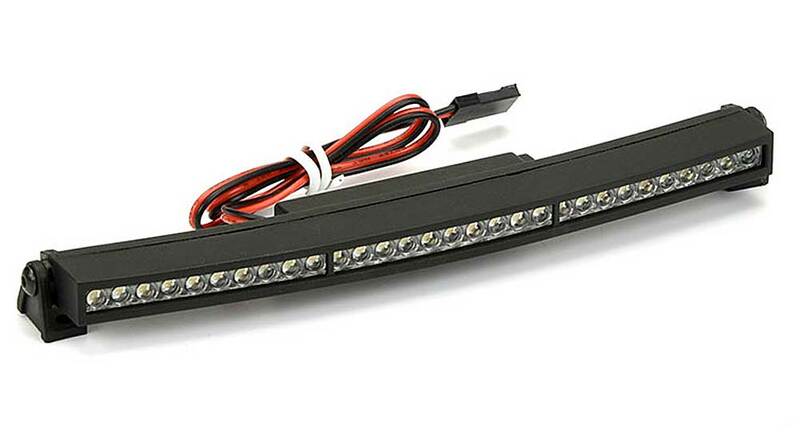 If you want even more light, the front bumper on the STT also has provisions to mount and additional, smaller light bar. Now that we’ve suggested some upgrades, it’s time for you to get to work! Once you do, shoot us some pictures and we’ll get them posted on the CompetitionX Facebook page!